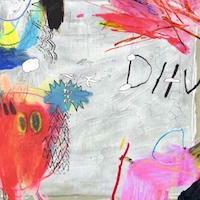 Four years in the making, the sophomore effort from DIIV is finally here. After being plagued by a plethora of issues, both legally and creatively, not to mention leading man Zachary Cole Smith’s idea that he’s probably going to die pretty soon, so this release is his way to achieve immortality. Finally, over-dramatic rock stars are back. These exclamations of perceived doom are valued only because his creative output matches his train of thought. On ‘Is The Is Are’, a double album no less, we’re treated to a sonic landscape filled with layered guitars and reverb-saturated vocals. First track ‘Out Of Mind’ is a dreamy, focused number that wouldn’t be a miss on a War On Drugs’ album. The slow-paced guitar that overlaps the faster tempoed bass guitar and drums creates a unique conflict in sound that really drives the song forward. With Cole Smith’s vocals, the tune is a strong performance that is only developed throughout the al-bum. “Everything you do, just comes so easily to you”, he sings, and you can’t help but think this parallels his songwriting talent. Sky Ferreira, Cole-Smith’s girlfriend, makes an appearance on ‘Blue Boredom’, utilising spoken word. It’s almost a post-punk ’80s facsimile that works oddly well when considering the previous tracks and how Cole-Smith’s vocals turn it away from post-punk and turn into a beast of its own. Carrying on, the tracks reach an almost instrumental state with vocals being few and far-between, building the overall atmosphere of the record. Considering the release’s length, its sole purpose should be to keep you going along this extended journey but the record can feel a bit too wandering at times. This is all taken back in with ‘Take Your Time’, with one of the stronger guitar lines that cuts through and forms a dark, brooding atmosphere. Title track ‘Is The Is Are’ has one of the more intelligible vocal performances, with the ultra-heavy reverberation of previous tracks being taken back a step, and has some of the finest production, with tape delay being employed to create a wall of sound that slowly begins to overtake the entire track, before becoming the last thing to ring out at the end. ‘Mire (Grant’s Song)’ is the most vicious sounding track, with the guitars being wildly layered, almost of out time with each other in places and the vocals encase the entire stereophonic field, so much so you feel almost drowned in it. The track is fantastically haunting, with even the inclusion of distant screams during the instrumental breaks throughout. The performance at this point continues this pace through till ‘Healthy Moon’, which reverts back to the previous, more dream-state approach. The final stages of this behemoth almost act as a resolution. Album closer ‘Waste of Breath’ utilises both approaches seen throughout the record, turning from an airy, hopefulness into an attacking, sinister break, to where it finally reaches an almost peaceful resolve. If this record were to be Cole-Smith’s finale so to speak, it would certainly be a worthy memorial. Throughout the album, we’re faced with a whirlpool of sonic personality that fits his persona extremely well, though there are moments that possibly should have been left on the cutting room floor. It’s a solid effort, and one that should hopefully solidify the career of a self-professed tortured artist. ‘Is The Is Are’ is out now via Captured Tracks. To read more on DIIV on TGTF, head here.